I hate the word "emo." But, I own some music that often gets lumped under that label. This is one of 'em. I really wish I knew this record better. I've had it for at least eight years, and during the first year I had it, I remember listening to it quite a bit. Listening to it now, it's not really coming back to me. This record was a gift. 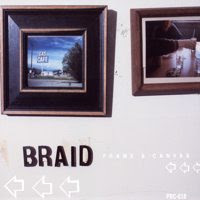 My friend Dave "Two Beers" Parker came to Portland from the Bay Area to visit me in 2000, and while we were discussing our mutual admiration of The Promise Ring, he asked me if I had ever listened to Braid. I said no. What about Hey Mercedes? Nope. He was determined to fix that. We hit Jackpot Records, and I ended up walking out of there with a copy of this, courtesy of the man they sometimes call "Dos Cervezas." Apparently this is a fairly influential record. To me, it always sounded like a band who couldn't decide if they wanted to be Fugazi or Superchunk. In the end, their t-shirts may have been too black for me.